The Columbia Experience Overseas (CEO) program offers Columbia students high quality internship experiences in a diverse array of industries in Amman, Beijing, Hong Kong, London, Mumbai, Seoul, Shanghai, and Singapore through alumni and employer partnerships. As globalization increases, international cultural exposure and work experiences become more important to successfully navigate and meet the demands of the changing work environment. Eight-week summer internship, Mid-June — early August. Housing with other CEO interns provided by CCE (required). Alumni mentor to provide personal and professional guidance and support throughout the summer. Financial Support for travel and visa fees (on a case-by-case basis). Gain a substantive international work experience and develop cross-cultural skills. 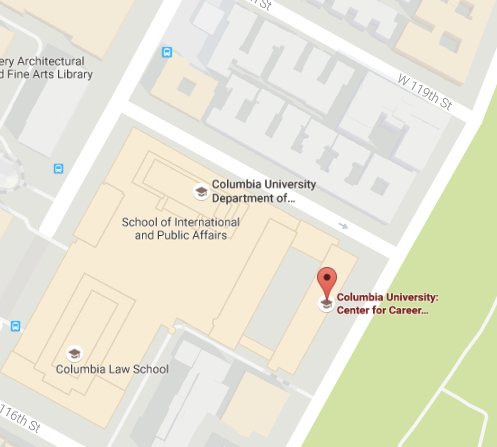 Develop a network of professionals and Columbia alumni in an international setting. Build an in-depth understanding and appreciation of the many facets of an organization. Be able to articulate your experience and reflect upon your internship experience to highlight key transferable skills. Currently enrolled student in good academic and disciplinary standing. Be able to commit to the full program. Have a desire to engage in new cultural experiences and be willing to expand your horizons. *Please note: By submitting an application, you authorize the Center for Career Education to conduct academic, disciplinary and financial aid checks to confirm your status. Certain University policy violations may disqualify you from consideration for the CEO program. CEO internships will be posted in LionSHARE. Search “CEO Amman,” ”CEO Beijing,” “CEO Hong Kong,” “CEO London,” “CEO Mumbai,” “CEO Seoul,” “CEO Shanghai,” ”CEO Singapore” in the “filter(s)” section to locate all program opportunities. You may apply to up to eight (8) positions of interest. Transcript (can be an unofficial transcript): This is your current semester course schedule that you access by logging onto Student Services Online, clicking on “My Schedule” and copying and pasting your course schedule into a Microsoft Word Document. The schedule should show your full name, your school, your Spring Courses, and your enrollment status. March — Offers will be given for the program. If given an offer, you will have one week to accept or decline the position. In accordance with the Undergraduate International Travel Policy all students traveling overseas through a Columbia led, Columbia facilitated and/or recognized program must submit a school sponsorship application 4-weeks prior to departure. Please note that you should begin your school sponsorship application once your international experience has been conﬁrmed but no later than April 11th. If you have not completed all pre-departure requirements 2 weeks prior to your departure date, the Undergraduate Travel Review Committee (UTRC) will report an allegation of noncompliance to Student Conduct and Community Standards. Student Conduct and Community Standards determines how to respond to the allegation based on whether the student has a related, prior disciplinary record. For more details visit the Undergraduate International Travel Policy website. Yes. You may apply for up to a total of eight (8) positions across all program cities. If I want to apply for more than one internship, do I have to submit an application for each one? Yes! In order to be a competitive candidate, we encourage you to tailor your resume and cover letter to the requirements, anticipated skills sets, and nuances of each position. Is there a language requirement for participation in CCE’s international internship programs? In general, no. If an employer requests specific language abilities, this will be stated in the job description. Can I speak to the student who interned at a particular company last year? If you have been contacted by the employer for an interview, and if the former intern is willing and able, we are happy to help facilitate this introduction. Keep in mind that our internship organizations change every year so you might be the first student to interview with that employer! What kinds of program activities are organized during the internship period? We help coordinate an intern dinner towards the start of your program, and an alumni-mentor event to facilitate networking. Program mentors may plan additional social and cultural activities. We also provide pre-program professional skills training and post-program reflection sessions to help you understand, appreciate and articulate your experiences. Yes. We arrange and provide housing for CEO interns. You are required to live in designated housing with other Columbia interns as part of any international internship. Salary varies by employer, organization and location. Keep in mind that internship salaries are typically never high; the value is in the opportunity to build skills, gain work experience, make professional connections and learn about an industry. If I am selected for an unpaid internship, how can I cover the cost of my living and travel expenses? You are welcome to apply for internship funding through programs such as the Alumni & Parent Internship Fund, Work Exemption Program, and Departmental Grants and Non-Columbia Affiliated Funding. We can provide limited funding to students who qualify for need-based financial aid at Columbia. We work with Financial Aid to determine which students qualify, and allocate funding to help students cover the cost of flights and visas (for international programs). Yes. If you will be abroad during the spring semester, indicate that in your cover letter. Make sure that both your resume and cover letter include your updated contact information. If you are selected for an interview, you can reach out to us and arrange a mock interview by phone or virtual meeting. Remember to check your emails for updates from us about your application status, as these are time-sensitive communications. Is a work visa required in order to participate in the program? Yes. If you’re selected, you must apply for a work visa for the country where your internship is. Although we will assist students with the application process, you are responsible for completing paperwork and submitting the necessary documentation, as outlined by the regulations of your internship country. I am an international student. Will I be eligible to obtain a work visa? Yes. You are eligible to obtain a work visa; however, the requirements may vary from those interns who are U.S. citizens, depending on your country of citizenship and the regulations of the internship country. Information regarding visas and work permits can be found on the Goinglobal database. If I am selected to be an intern, will I have health insurance while I am abroad? You cannot travel through any of these programs without health insurance. If you have Columbia University’s student health insurance, you are covered while overseas. If you are not enrolled in Columbia Insurance, you should check with your insurance provider to see whether or not they provide overseas coverage. There are two ways to learn about CEO internship opportunities. Search all internship opportunities in LionSHARE using the “CEO” program labels. Interested in learning about other Columbia University students’ experiences during their CCE sponsored internships? Read about internship experiences from all of our internship programs! The only Middle Eastern program site, CEO Amman oﬀers Columbia students an unparalleled international experience. You will be exposed to the unique culture of one of the oldest cities in the world, while taking advantage of all of the amenities, entertainment, and professional opportunities of a 21st century metropolis. With the presence of the Columbia University Middle East Research Center, a hub for research and scholarship, students beneﬁt from additional support within the university’s growing global network while living and working in Amman. Launched in 2010, this program has been a destination for students eager to learn about Chinese history and culture, while simultaneously gaining career-related skills. With the East Asia Columbia Global Center and a strong alumni network located in Beijing, students are able to immerse themselves in this historic city and strengthen their skill sets while remaining closely connected to the Columbia community throughout their summers abroad. Spurred by a large and active alumni presence, CEO Hong Kong was launched in 2007 during the program’s inaugural year. The city’s fast-paced environment, stunning sites and culture, and reputation as a gateway to Chinese and global business makes this location ideal for Columbia students searching for international experiences. As one of the oldest sites and with a strong local Columbia University network, CEO Hong Kong has provided numerous students with opportunities to explore career paths and connect with professionals in a global context. Since the CEO program’s inception in 2007, London has been a popular destination for Columbia students looking to gain international work experience. As a global metropolis, London provides opportunities for students to intern in a range of industries at the center of commerce. A large alumni network in the region provides additional support for undergraduates working abroad and the city’s rich cultural history oﬀers an exciting summer experience both inside and outside the workplace. Mumbai, formerly known as Bombay, is one of India’s largest city. Mumbai is also the home of “Bollywood”, and is full of old-world relics right beside its modern skyscrapers. With world-class professional opportunities situated next to the beautiful Arabian Sea, Mumbai is a culturally rich city. For those seeking both exciting professional and personal opportunities, CEO Mumbai is the perfect program. Having launched in summer 2016, CEO Seoul continued the excitement of the CEO program, which combines high quality internship experiences within a diverse array of industries with rich cultural experiences. Seoul is not only one of Asia’s top economic powerhouses, but it also contains incredible culture, cuisine, and, of course, K-Pop. Seoul has something for everyone. Students interning through CEO Seoul will engage with global companies and connect with Columbia University’s active alumni community, all the while exploring the endless opportunities that South Korea and East Asia have to oﬀer. Students seeking unique cultural experiences along with opportunities for professional development have been drawn to CEO Singapore. Known as a cosmopolitan melting pot, this city boasts diverse cultures and ethnicities, renowned art and cuisine, and leading companies from an array of industries. CEO Singapore’s central location, which allows for easy travel throughout Southeast Asia, and its diverse oﬀering of internship opportunities provide students with dynamic international and professional experience. Since 2010, CEO Shanghai employers have provided a diverse range of internship opportunities for Columbia University students throughout the summer. A fast-paced environment, characteristic of both New York City and Shanghai, has made this CEO location a popular destination for students looking to get out of their comfort zones, yet still experience an upbeat and culturally-diverse city. As the region continues to become more cosmopolitan, CEO Shanghai positions have expanded across numerous industries to provide exceptional internship experiences for students.